Chrissy Murderbot Royal Wedding Party – The global community for audio culture. 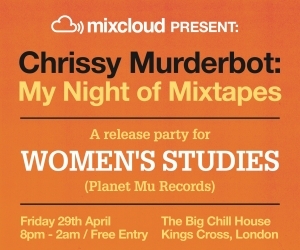 We’re very much looking forward to our party this Friday with Chrissy Murderbot, down at the Big Chill House, London. Chrissy will be joining us all the way from Chicago to celebrate a night of “juke-rave-jungle-disco-tropical-hi-NRG-gangsta-dancehall-ghetto-garage-core” plus the forth coming release of his new album on Planet Mu Records. We’re also excited to announce that the winner of our, ever so slightly tongue-in-cheek, Royal Wedding DJ Competition – Laurent, will also be joining to warm things up Mixcloud style, on Chrissy’s recommendation. Of course, this isn’t the official after party, but if you’re in London on Friday and looking for somewhere to get loose after the big day, head on down and join us!